Lounge by the rooftop pool and admire 360 views. After a day at the beach, come home to your spacious condo. You're a five minute drive from Ala Wai Golf Course. Aqua Pacific Monarch is just one block from a coveted stretch of Waikiki Beach. You have endless rolling waves on one side and the protected swimming area of Kuhio Beach on the other. Don’t bother unpacking once you get to your condo, just get changed into swimsuits, spray everyone head-to-toe in SPF and get ready to hit the scenic rooftop pool. 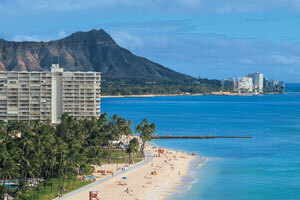 It features outstanding 360 views of the ocean, Diamond Head, and the glittering lights of Honolulu. Go for a swim or relax poolside with the latest issue of O, The Oprah Magazine. For a bite to eat, the resort has two Japanese Restaurants on-site, Jinroku and Musubi Cafe. On your way back to your condo, stop by the sundry shop for any last minute essentials you may have forgotten to pack. Studio condos sleep four guests and have city or partial ocean views. One-bedroom condos sleep four guests and have ocean or partial ocean views. All condos have fully-equipped kitchenettes because sometimes a mini-fridge just isn’t good enough. Bring the kids along to the Food Pantry for groceries, and stock the refrigerator with everyone’s favorites. Freezers are perfect for storing dessert – fudgsicles for the kids and a Ben & Jerry’s stash for the grown-ups. Up for a low-key night in? Cable TVs with DVD players have you covered. Bring favorite movies from home, gather everyone in the living room with a selection of snacks and get ready for family movie night. Aqua Pacific Monarch is a short walk to the forty-two-acre Honolulu Zoo. It is home to several animals including endangered species. Endangered birds that can be found at Honolulu Zoo are the palm cockatoo, Laysan teal and Cuban amazon. Asian elephants, African wild dogs and chimpanzees are the endangered mammals that can be found at the resort. Endangered reptiles include Komodo dragons and Galapagos tortoise. The golfers in your party will love Ala Wai Golf Course, just a short drive from the resort. It welcomes golfers of all skill levels and has rental clubs available. The eighteen-hole course was designed by Donald MacKay and opened in 1931. For those who’d rather shop than golf, take advantage of the resort’s shuttle to the Ala Moana Shopping Center where you will find everything from department stores to high-end shipping to bargain stores. Department stores include Nordstrom, Neiman Marcus, Bloomingdales and Macy’s. Burberry, Versace, Prada, and Chanel are the high-end shops featured at Ala Moana. For the bargain hunters, check out Target and Ross. Get your caffeine fix at The Coffee Bean & Tea Leaf. Hungry? Forrest Gump fans will love Bubba Gump’s Shrimp Co. Enjoy delicious seafood and trivia from the movie.